I should update about TAG Bristol at some point, but I caught a horrible chest cold and have been pretty much bed ridden since Sunday. Except…! 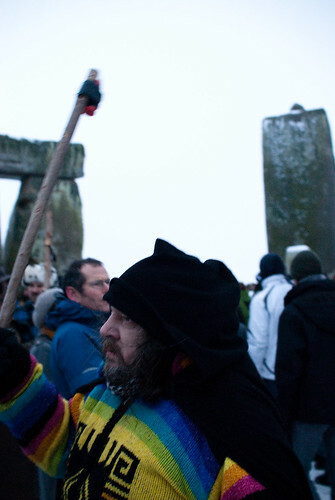 Damn the illness–we decided at the last minute to go to Stonehenge for the winter solstice. Sadly, English Heritage has closed off the rocks to tourists, limiting access for most people most of the time. 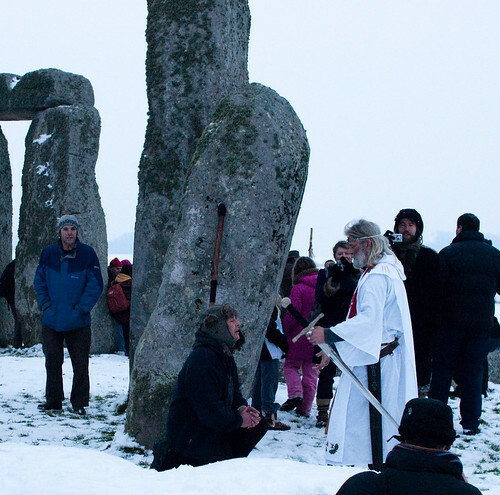 But twice a year they open up the stones for druids to worship during the solstices. While I’m not particularly religious (or a druid!) I wasn’t really interested in seeing Stonehenge unless I could lay hands on the thing, so it was perfect timing for me. We woke up at 5, and got on the road from Bristol by 6, and were at the monument by 7:30. At first I had heard that there wasn’t going to be parking available, so we had pulled up to park on the highway, but were waved off by the police. They let us park in the parking lot anyway, and were actually pretty pleasant, for being up on a very cold and snowy morning in England, right before Christmas! We walked up to the stones and it seemed that there were mostly onlookers there, not as many druids. People kept telling me that “travellers” were going to be there, and as I have no idea who these people are, I was interested to see them. They just looked like folks from San Francisco to me! It was very laid back, and everyone was friendly and happy. There was some kind of small ceremony in the middle and a war veteran who just arrived from Iraq was knighted. Then the crowd started to disperse, and people seemed content to just touch the stones, take photos, and chat. The sunrise after the longest night was somewhat of a non-event–you couldn’t seen a thing in the hazy white English pre-dawn. 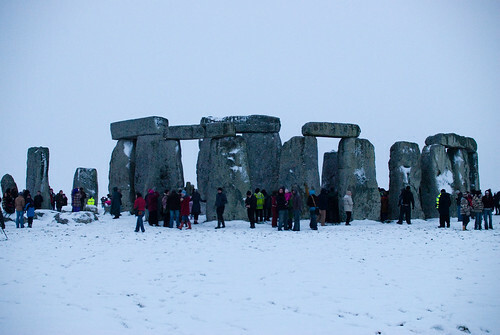 A bit after the druids started clearing out a snowball fight erupted in the middle of the stones, with people ducking behind them and firing away! Sadly, I don’t have very good photos of that, but there’s a pretty good one here. 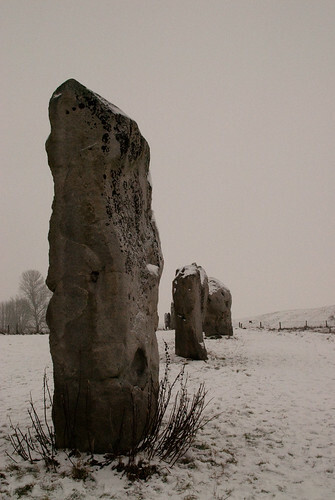 We went to Avebury afterwards, which was deserted, but had some distinct remains of rituals past, and lots of tracks in the snow. I was delighted to see the monuments still being used and lived with and loved. 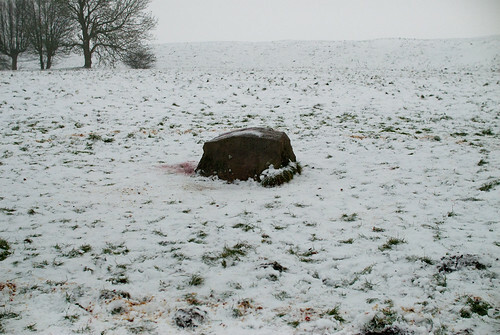 Traveling in England in the wintertime is like walking around with your eyes mostly closed. Drowsy gray skies, fog seeping in-between your scarf and your neck, under your coat, and around your fingertips. Last night I had a few pints with friends at the Coach & Horses, forgot to eat dinner, and ducked into a minicab to get home. London is starting to look familiar to me, with the low brick houses, white trim, and wiry black fences. This morning I caught the Cardiff Central train from Paddington station to Bristol, heading straight into a daze of snow. The snow was falling in London last night–big, fat flakes against the black night–but the glowing flurry blowing around the train is indistinct, powdery pink and gray. I’m trying to put the finishing touches on this paper, but even as I come to the end it seems like dragging my feet through sludge. My mind wants to be doing almost anything besides writing, and so I stare out of the window at the houses, trees, and fields diffused through the smeary snow. The English countryside is a landscape dreaming of itself, re-iterated over centuries, absolutely secure in the belief that this is what the countryside is supposed to look like, the gold standard of pastoral bliss. Low and flat and still green beneath the hulking, ponderous clouds that seem so much more layered and complex than the puffy fluff over Texas or the flat gray Bay area mist. Writing this has made me able to start on my paper again–something about a loose, descriptive narrative allows me to segue back into the messy jargon of New Media crashing into Archaeology.